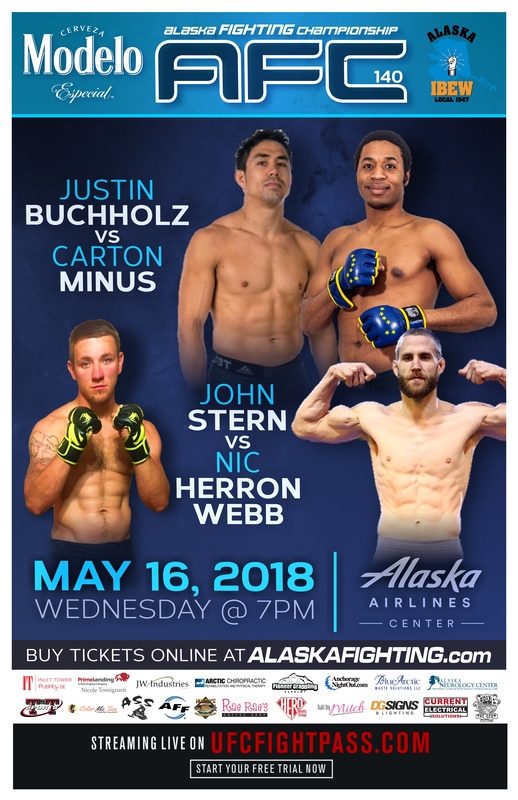 IBEW local 1547 & Modelo presents AFC 140 “Buchholz vs. Minus” Live MMA returns Wednesday, May 16th at The Alaska Airlines Center. Join us for the last event of the season as Coach of the year and MMA Phenom, Justin Buccholz returns to his roots to face top Alaskan prospect, undefeated “Clutch” Carlton Minus. Also on the card is the return of everyones favorite fighter, “Naptime” Nic Herron Webb as he faces middleweight contender John “The Kidd’ Stern for the AFC Middleweight Championship. Grab a Modelo which is brewed with the fighting spirt and join us for nonstop mixed martial arts action! AFC 140 – Wednesday, May 16th, LIVE at the Alaska Airlines Center. AFC is an all ages event and we offer free parking! Doors open at 6’oclock first fight at 7 ! Get your tickets online and check out the full fight card at alaskafighting.com!